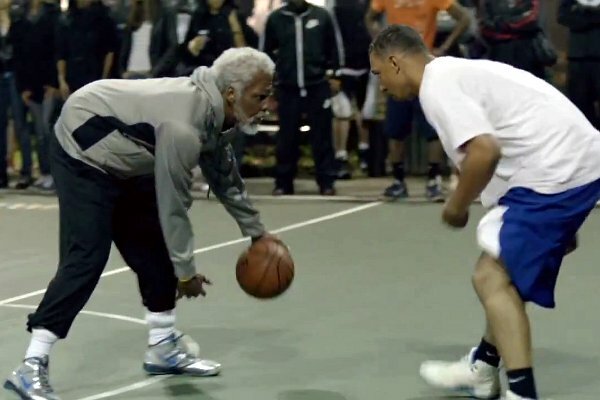 America has fallen in love with Uncle Drew. The video was filmed at Clark’s Pond Court in Bloomfield, N.J., which is close to where Irving’s father lives. Local players were gathered and told that Pepsi Max was filming a documentary on a character named Kevin who they claimed was a youth basketball coach. Other than Irving, Kevin and the player whose injury leads to Uncle Drew entering the game, no one on the court knew that it was actually Irving under the makeup. The video was posted two days after Irving was officially announced as the rookie of the year. With no media behind it, the video garnered 10 million views. With 80 percent of the viewers watching four minutes into the five-minute video, and the key target demographic of males from 25 to 54 accounting for most of those views, Pepsi Max decided to create a series of trailers to the video to be shown during the N.B.A. finals, representing a significant advertising purchase. Even so, the decision was made to stay true to the viral roots of the video by not giving away anything in the 30-second spots. The paper reports that the ads received a 98 percent like-rate on YouTube and made the front page of Reddit. During Game 5 of the finals, Irving was trending worldwide on Twitter, under both his name and Uncle Drew’s name. Irving is playing it low-key for now, but says Uncle Drew will be back. If there is one surefire way for a professional sports team to fail it is to listen to media members who decide a team “must” do something, usually in regard to player transactions. Such is the case with the latest on the Browns and quarterback Colt McCoy, who the should move “ASAP” according to Pro Football Talk. While most of the names have changed since 2007, the Browns desperately need to avoid any situation in which McCoy would be playing and Weeden would be watching. When Derek Anderson got the nod five years ago after Charlie Frye (another former third-round pick) was traded after a disastrous Week One showing against the Steelers, Anderson felt zero pressure because everyone assumed he was holding the spot until first-rounder Brady Quinn was ready to play. And then Anderson, who wasn’t forced to look over his shoulder and could relax and play football without obsessing over whether the next incompletion would be his last one, played very well. By 2008, Anderson was the starter. And then he had something to lose. And lose it he did. And Quinn could never find it, not with Anderson still looming. Given that history, who cares whether the Browns get anything for McCoy? The better plan is to get the most out of Weeden, and that won’t happen if McCoy somehow ends up on the field once the regular season starts or, perhaps even worse, hovering over Weeden’s shoulder if/when he struggles to take advantage of all the attention that opposing defenses are paying to running back Trent Richardson. Yes, the Browns should just give away McCoy because Anderson had a great eight-game stretch five years ago. And because Anderson was mentally weak then that must mean Weeden can’t handle the pressure of having McCoy “hovering” over him. If Weeden can’t handle that, then the Browns have bigger issues than what to do with McCoy. It should probably come as no surprise the PFT is once again critical of the Browns. Florio has it in for the team because of the whole Tony Grossi affair, which Florio has tried to pin on the Browns (a conspiracy that even Jesse Ventura finds laughable). As we pointed out last week, training camp doesn’t start until July 29. The regular season doesn’t begin until Sept. 9. So why should the Browns be in any kind of rush to make a decision on the back-up quarterback position?